The short position entries for EURUSD and AUDJPY at the latter half of the week turned out to be false alarms. 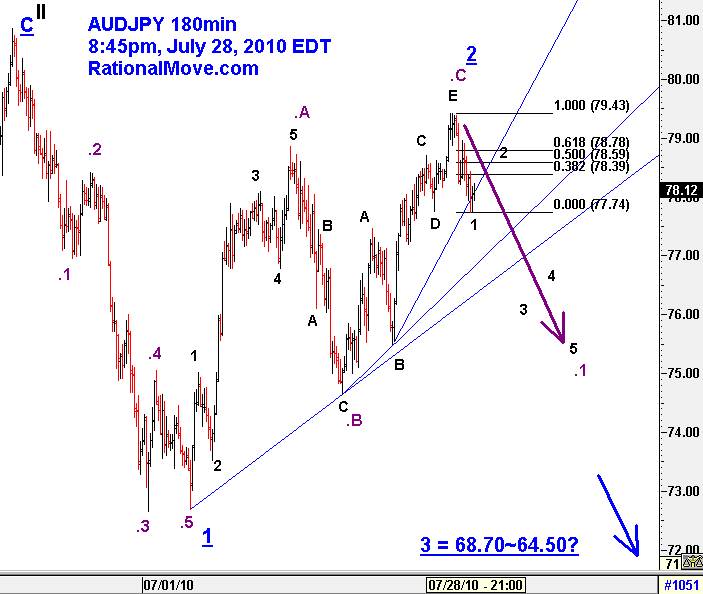 About 24 hours after the entry of AUDJPY, I first noticed that AUDJPY’s downtrend was not impulse, and AUDUSD looked rather 4th wave of purple .5 as in the chart below. GDP came in (I really don’t care much on the GDP number itself), and the initial reaction did not accelerate EURUSD’s descent. So, I sensed it was the time to get out. And I was lucky to have done so while my position was still profitable. In retrospective, I may have been trying to sell at the very top. One has to be extremely careful when he/she happens to be trying to catch the top or bottom. 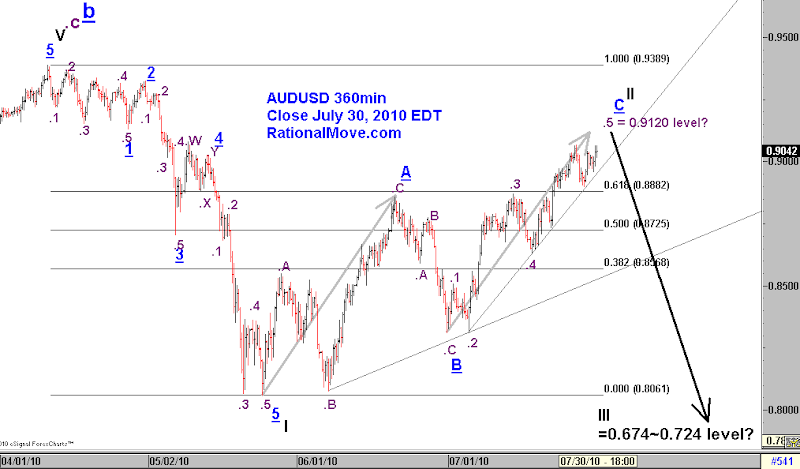 So from here, I will rather watch AUDUSD to know the time to be short Aussie again. Gray arrow is the blue underlined A wave, and I have been using it to gauge the travel length of blue underlined C wave. It points that the 0.9120 is the goal, and it is getting closer. I’m anticipating a great fall of Aussie from there at least down to 0.724 towards September and October. I have been switching around between AUDUSD and AUDJPY. I’d like to trade whichever has the clearer wave definition at the time. I do not have an open position at this point, but I’m keeping the short EURUSD entry order at 1.2940 for now. 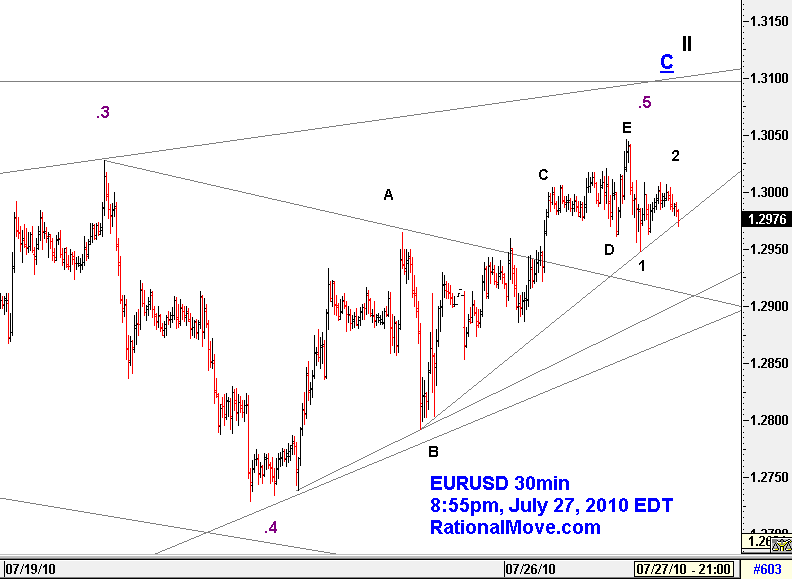 I don’t have much time to write, but here are more detailed Elliott wave counts for EURUSD and AUDJPY. Here is my pending orders and open positions (currently flat). The buy power is diminishing rapidly under the May 10 high (1.31). The purple .5 wave uptrend from July 21 is non-impulse. 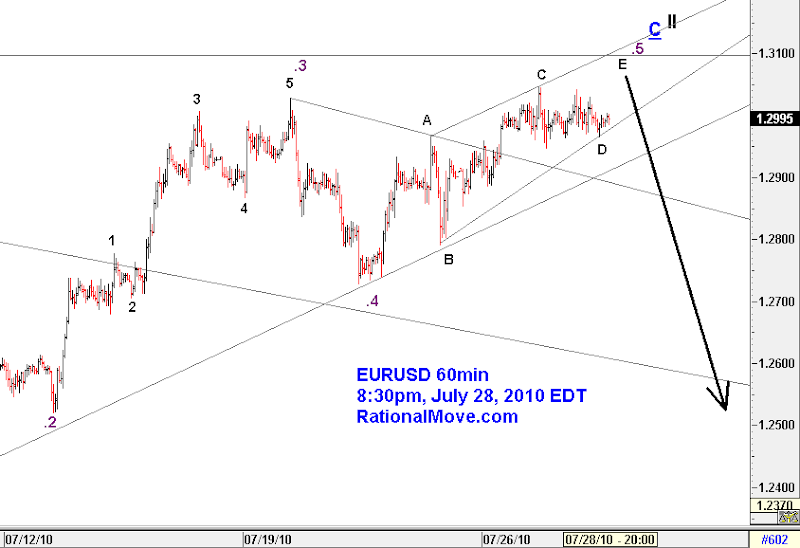 I think this is a good reason to sell EURUSD, especially once 1.2950 will be broken down. So, I set stop sell entry order at 1.2940. Once it’s filed, my stop loss is at 1.3060. To put it into perspective, this position may be held until 1.1877, or even towards euro-dollar parity (1.00). So the potential reward is huge!